Jones defeat Shogun which announce the new light-heavyweight champion. 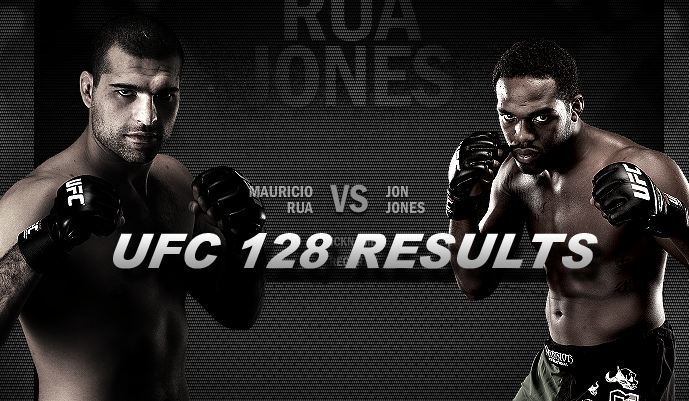 UFC 128: Shogun vs. Jones – marks a new record for Jon Jones to steal the belt form Mauricio “Shogun” Rua, the event take place at Prudential Center in Newark, N.J. In addition to the night’s pay-per-view main card, which also features Urijah Faber vs. Eddie Wineland and Brendan Schaub vs. Mirko “Cro Cop” Filipovic, among others – UFC 128 features two bouts that stream for free on Facebook.com/UFC. Here are the UFC 128 results of the matches if ever you miss it. – Gleison Tibau def. Kurt Pellegrino via split decision (29-28, 28-29, 29-28).